Spectacularly beautiful all year round, Bodnant Gardens is one of the most magical gardens in Wales. 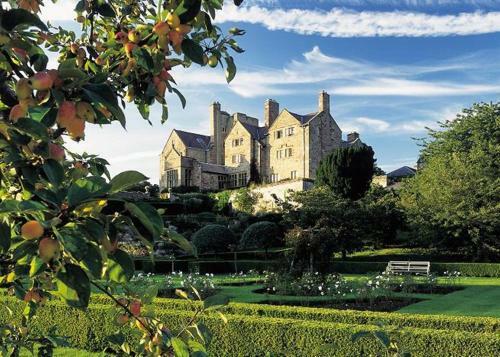 Now belonging to the National Trust, it’s situated a few miles inland above the River Conwy with breathtaking views across to the Snowdonian Range. Visit Bodnant Gardens in early spring for carpets of snowdrops, hellebores and daffodils. Later in the season you’ll see displays of rhododendrons and azaleas and the world famous laburnum arch. Foodie Travellers will love its combination of landscapes, exotic plants, stunning flowers and excellent tea shops. Even better, there’s a Welsh Food Centre nearby brimming with gastronomic delights and a Cookery School too. Built in 1792 and occupying 80 acres, Bodnant Gardens and Hall belonged to a liberal politician and his wife, a talented horticulturalist and founder of the Liberal Women’s Suffrage Union. The garden which is open to the public, has previously been voted “The Favourite Garden in the Country” by The Daily Telegraph. Walk around the upper level and you’ll find Italianate terraces, formal borders and sweeping lawns. On the wilder lower level, known as the Dell, you’ll see plants that have come from all over the world, their seeds or cuttings collected over a century ago. Buy a delicious soft scoop ice cream and go for a magical wander around the garden. Play croquet on the lawn, soak up the powerful scent of summer roses or simply sit back, relax and watch the dragonflies dart across the lily pond. Earlier in the season, the terraces play host to a spectacular display of camellias and magnolias bursting with spring fragrance. At the bottom of The Dell, cross the waterfall bridge into the lowest part of the garden with its magnificent collection of Redwood trees towering above you. Rest your feet and enjoy a mug of tea in the Dell Tea Shop where, in winter months, you can warm yourself by the blazing outdoor brazier before climbing back up. Recover from your climb with a leisurely lunch in The Pavillion Tea Room and a glass of locally produced wine or beer. The Magnolia Tea Room with its cosier feel and courtyard location serves tea, homemade cakes and scones. I’m welcome every day during the winter. From May to the end of August, I’m invited to Wag Wednesday when the garden is open to dog walkers in the evening from 5-8pm. Find more Foodie Things To Do in North Wales. Discover more Gourmet Gardens.